BFD2.1 is a great update, and best of all, it's free. New users should deﬁnitely take a look too. Simple and useful improvements to the GUI. 'Load On Demand' RAM optimisation is a godsend. Now includes algorithms from PSP's Vintage Warmer. 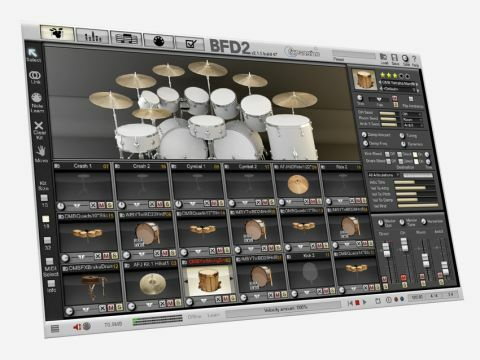 BFD2 is FXpansion's drum sample player, delivering the sound of drum kits and percussion. What made BFD a world beater (pun intended) in the first place is that it was one of the first plug-ins to present a collection of drum samples as a real drum kit, with scope to mix in overhead, room and ambient mics. BFD2.1, the latest update, is available as a free download for existing users and concentrates on improving the user interface and handling of samples, with some new effects for good measure. 'Load On Demand' limits the number of samples that BFD2.1 loads in by default, thus leaving more RAM available for other tasks. A typical kit is now reduced from 500MB to around 100MB in size. One possible down side is that with many layers of samples now missing, the jump between velocity levels could be painfully obvious. However, BFD gets around this by loading in the missing samples as and when you play them. This is an excellent facility, helping BFD to better coexist with your other plug-ins. It justifies the upgrade in itself. New effects include four reverb algorithms licensed from Overloud, the manufacturer of the Breverb reverb plug-in. These give you plate, hall, room and 'inverse' reverb sounds - all are good. The inclusion of PSP's Vintage Warmer is a surprising move - now you can roughen, toughen and saturate your drums in the way that only Vintage Warmer can. The new envelope generator enables you to adjust the overall loudness shape of the drum sound in a similar way to using a compressor. You can add emphasis to the attack portion of the sound, or soften it if you need to. The improvements to the user interface are welcome, and long overdue. You now have the ability to replace, swap or move around instruments between the slots of a kit. This might not sound like a big deal, but it actually speeds up the creation of new kits no end. BFD2.1 is an amazing product - stable, well-priced and featuring some of the best drum samples on the planet. There's nothing to lose for existing users and lots to attract newcomers - the new effects are really good but it's the inclusion of 'Load On Demand' and the changes to the user interface that justify the download.